Yo ! SuikodenGamers Indonesia !! Let's join !! Hero mana yang paling kmu suka?? Am i gonna lost you again? I open my eyes. And i see Nanami standing beside my bed with angry face. "Wake up! it's already 8 AM!" And Nanami exit my room and go downstair. I observe my room then open the window. Ahh the morning air is so nice in Chisa Village. I better hurry up. So I change my clothes and go downstair to tavern. I still feel strange. Several times ago, we are in two different side. I'm with the coalition army. And Jowy as the king of highland army. And now suddenly the old Jowy comeback. It's still nice Jowy who i know from childhood. And i'm glad the war is over and we still best friend. No! not just best friend! We are brothers! Nanami still same person for me. Nothing change from her. Although i almost lost her last time. But she never change. Still a cheerful and sometime so annoying. Ha..ha..ha i just joking. She is still a great sister. She doesn't like stay too long in one town/city. She likes adventure. Then after finish our breakfast, we walk to the entrance door. But suddenly a big guy standing in front of Nanami and make her fall. "Hey it's not my fault! It's you who suddenly stood in front of me!" The guy is black. He wear some bear skin on head. And bear axe in his back. "Hallec! what are you doing!?" The other guy who looks like the big guy friend come from outside. This guy wear a knight armors. The armors have green and orange stripe. And he also bear sword and shield. "Tell your big friends to watch his mouth." Said Nanami as she began to wake. "Hey calm down, sis. He already make apologize. Please forgive my sister sir..."
"I'm Mua from the Kamaro Knight and this my friend Hallec"
The knight intrduce himself and his big friend. you made it by yourselfs...? Jadi paling tanda bacanya aja, di belakang kalimat masih ada yang kurang titik..
Mua is staring at us. It makes me uncomfortable. "Looks like you aren't from Grassland neither Harmonia." "Oh yes. I'm Riou, this is Jowy, and this is my sister Nanami." "We are traveller from Dunan"
"Oh Dunan, i see. There was a great war in there several times ago." My memories go back. I remember it began when Jowy and me became highland army. It began in Tenzan Pass. And end in there too. "I'm sorry sir, we have to go now." "Oh of course. If you need any help just ask me. I'll be at the tavern. So we go outside. Some unnusual creatures hang out in this village. In front of armory i see a big lizard with big sapear. Looks like it's lizard clan. And there's a Karayan guy standing near grape fields. Maybe we should so to Karaya tomorrow. And i also want to go to Zexen. So Nanami decide to go to equipment shop to buy supplies. I told Jowy how about go to Karaya tomorrow. I remember about Hallec and Mua. "Uhm...why don't we ask the knight help. It seems he already often pass that forest?" "Do you trust him? I mean i trust him too but it seems his friend doesn't like us so much." "Yeah Hallec seems unfriendly. But we never know if we never ask." Nanami then comeback with our supplies. I tell Nanami about my plan. She's happy about the plan but she doesn't agree about asking Hallec and Mua help. "Aw c'mon we haven't know how dangerous the forest." "Yeah but asking help that barbarian!? Hell no! he's so rude. Jowy say something to Riou!" "Maybe you're right. Hallec looks unfriendly." "But if we don't ask, we won't go to Karaya." I smile to Jowy. He always understand my mind. Then we want to comeback to the tavern. But then some noise come from sky. I look at the sky and see some group of insect fly over us. No! it's not just insect. It's insect army with a rider on them. I wonder who and where are they go. So i ask one of the native about it. The native tell me that it's called mantor. It's heading toward Le Buque in Harmonia. I feel amazed that there is insect army in Harmonia. "Of course not, i just feel amazed. Let's go to the tavern"
We enter the tavern and approaches Hallec and Mua. We tell him about our plan. And how fortune come to us. The are planning go to Great Hollow tomorrow. That means that we are on same route. "Then it's settled. We will go tomorrow morning. I'll wait you in here and please don't be late." I'm happy because we get companion but it seems Jowy and Nanami right. Hallec doesn't look nice at all. "WAKE UP YOU LAZY BOY!" But then i quickly jump from my bed before Nanami kicked me again like yesterday! "Now that's good if you realize we will late if you don't hurry up." Yeah, i remember. We will go to Karaya! I get mess and get downstair to the tavern. Everybody already wait me. Finally we walk out the tavern and bye-bye Chisha hope we will here again soon. Usually it takes about 7 hours by foot to arrive at Karaya. I'm talking a lot things with Mua on the road. Hallec is in the rear with Nanami and Jowy. "So how both of you can be a companion?" I ask Mua about his friendship with Hallec. "Flame Champion? never heard of it. Who is it?" Then Mua starting to tell me about the Flame Champion and his fire bringer who fight Harmonia for Grassland with his true fire rune. "So where is he now?" "No one knows whereabout of Flame Champions. But i believe he live somewhere in the grassland." "Oh i see, by the way what's your business in the great hollow. I heard if that place is incredible." "That's right, great hollow "house of the lizards clan". I've been there 3rd time and this is forth time. I'm going there because there is a rumour that there gonna be a war between Zexen and The Grasslands." I continue to walking. Time passing by. And we now arrive at Kuput Forest's entrance. We enter the forest. Mua and Hallec in the front. Jowy, Nanami, and Me stay in the back. The story is right, Kuput Forest is so confusing. It has many paths. And it seems something keep stalking us form the wood. Hallec is the guide. He looks know well the path that lead to Karaya. We keep walking and the sun has move to the west now. So all of us begin to search wood for fire pit. Hallec comeback and wow! He comeback with a big wildboar! So we have wildboar as dinner tonight. We chat a lot during the dinner. But Hallec just keep quiet like a statue We share some story. And at last it's already late and we all ready to rest. But suddenly from the dark forest a big creature approaches us! Easy, they will have role in future. The big creature start moving toward us. It has four legs. And it's teeth very sharp. We all draw our weapon except Hallec! Hallec just standing quietly and grin. Yeah! it's a little puppy with a black scarf on it's neck. The big things we seen was it's shadow. The puppy come to Nanami and start sniff on her. Nanami pick up the puppy and see on the black scarf. "It has a tag. It's wiritten Koroku. So he's name is Koroku!" The puppy smile and start to lick Nanami face. Koroku looks happy. We all laught. We first think that a monster will come out. After that we start to rest. Nanami keep Koroku with her. Someone lick may face. And pour a warm water. And it's smelly. WARM WATER AND SMELLY!? I scream and wake up. Everybody laught at me. I saw Koroku and he just has been pee in my face! I clean my face with water. Then we all start to have breakfast. Our breakfast is mushroom soup. Hallec collect the mushroom around the camp area. And this taste delicious! Jowy and Nanami are giving Koroku food. They like him. "No problem. But are you sure it's have no master?" "Okay then. But make sure he doesn't pee on me again." Jowy and Nanami laught. We already finished our breakfast. This is a long dark path. It's creepy. But we are happy because finally we will arrive at Duck Village. By the way to go to Karaya from Chisa we must go to Duck Village first. We continue to walk. But a creature come from front of the path. And here comes the Giant Spider! "Prepare your weapons!" Hallec scream. We draw our weapons again and now we sure it's really a monster not a puppy. Mua go forward first. He try to stab the spider eye, but one of the spider's leg hit him and throw him back. Then Hallec approach the spider. First he success to cut one of the spider leg. The spider scream because of pain. And suddenly it's throw the web form mouth to Hallec. Hallec's now covered by web and can't move. I'm attack from left and Jowy from right. The spider legs try to hit us but we evade it. I'm not feel afraid. But somehow i enjoy it. Once again Jowy and me fight togehter. Now my tonfa can reach the spider's head. I hit it hard with my tonfa combo. Then Jowy jump and with his staff, he stab the spider's eye. The spider going mad and start to attack at any direction. We still to keep evade it's legs. Now i'm exactly at the front of his head. I spin my tonfa and hit the head hardly. The spider open his mouth because of pain. And at the time Jowy stab his staff on spider's mouth. Bloods come out from the spider's mouth. And finally it's death. We release Hallec from the spider web. Then we help Mua. He was unconscious. Then Nanami checking our condition. After everyone feels ok, we continue to walk. "It's Hallec and me who must say thank you. Without you we maybe have been eaten by that spider." "Well it doesn't matter. Okay then take care. Hope we can meet again soon." And then Hallec and Mua continue his journey to the great hollow. It's already evening now and we are tired. So we decide to stay at the Duck Village for one night. Motto : Always bear in mind that your own resolution to succeed is more important than any other. ARE YOU SERIOUS THAT YOU MAKE THIS BY YOURSELF???????? Motto : everything begin from one thing.. Duck Village, like it's name this place is full of duck. Not just ordinary duck but talking duck. Yeah they are the duck clan. And this place smell so fishy. We walk to the inn and check in for one night. Before we sleep, we have a dinner. And of course we have fish for dinner. After dinner we go to sleep. but the innkeeper won't let Koroku to sleep in the room. So we ask him to give us blanket and Koroku will sleep in front of the room. And the nights getting dark the we fall asleep. It must be the ironhead! We will going to WAR! I wake up in the moring. The fresh air from the lake is so nice. But the fishy smell is so annoying. Nanami is still sleeping but Jowy isn't at his bed. Where is he going? I go outside, and i see Jowy sitting in the side of lake. Glanced the blue water of lake. "Oh good morning Riou, you've wake up already." "Are you alright? Your face look so pale." "No, there must be something. C'mon talk to me. We are friends right." "Riou. Do we still friend. Don't you have grudge against me?" "Why? Why i must have a grude? I know we once in different side. We must fight each other. But who's care. It's a long time ago Jowy. And i know from that time in Muse we lost you, that you have your own way." "Thank you, Riou. For always trusting me." Jowy and me glance the lake as the sun begin to rising. Then Koroku come to join us. A moments later Nanami wake up. After that we get a mess and go to tavern to having a breakfast. And it's fish again. Then everybody laugh. Koroku too! I didn;t know before but somehow Koroku understnad human language. The suddenly a duck come to us. "Excuse me lad, you're not familiar here. Who are you" The duck said with angry face. Oops maybe he insulted with my joke. "I'm goint to Karaya too. Do you mind iof we travel together. I always want to know about Dunan. By the way, my name is Sgt Joe." Motto : Never give up before become a winner ! Oh maaan, it's really AWESOME !! great because there is Suikdoen 3 too, but why must Mua and Hallec ?? hehehe.. why not Luc !? why don'y us be the next role in the future? Short of story we decided to travel with Sgt Joe to Karaya. We leave after having breakfast. To go to Karaya we have to pass Amur Plain. It's very wide grass fields. Sgt Joe tells us a lot about Karaya. He also said that he has one pupil who is the son of the chief. Now we nearly arrive at Karaya. I can see the village. Then from the sky i see a hipogriff flying above us. And a boy ride on the hipogriff. The hipogriff land in front of us. Sgt Joe wave his hand to Hugo. Hugo come to Sgt Joe and hug him. Hugo then look at us. "Oh, they are traveller from Dunan. They come to visit Karaya." Suddenly Nanami and Koroku run into the hipogriff to see it from near. At first the hipogriff seems want to attack.But then Hugo give it a sign if Nanami is friend. And suddnely the hipogriff become so tame. "Really? Can i ride it?" "Of course you can. Let's go." Then Hugo help Nanami and Koroku get up to Fubar's back. After that Hugo come up too and they fly through the amur plains to Karaya. Sgt Joe, Jowy, and me follow they by walk. And finally we arrive at Karaya. Karaya is a village with all the people are have a talent to use weapon. Even the women are very good with weapon. We enter the village and see the Karayan are training with a big guy command them. The guy named Jimba wave his hand to Sgt Joe and continue to train the warrior. We walk through the village and we arrive at font of Chief's house. Hugo, Nanami, and Koroku already wait us. Nanami look so pale and she is so frightened. We enter the chief's house. And a boy with the same age with Hugo come to us. "Oh yeah, but i'm getting better at battle. Wanna try me?" and the boy act like he are going to battle now. Hugo and Sgt Joe laugh. "Well Lulu, could you call my mother? We have visitor here." "Oh sure Hugo, wait a minute please." said Lulu and he go to inside of the house. A minute later a woman come out from inside of the house. She's look familiar. I tried to remeber who is she. Then he finally greet us. No! not us! She greets Jowy! They are already know each other! Motto : F1 & Suikoden Forever! 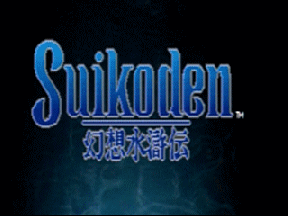 Stars of Destiny Indonesia :: Castle / HeadQuarter :: All 'bout Suikoden !! Join polling too ! !